2009 December « CASE CLOSED … what really happened in the 2001 anthrax attacks? * Where is the FBI’s evidence that Dr. Bruce Ivins is the sole perpetrator or even involved in the 2001 anthrax attacks? in the 2001 anthrax attacks? Director Mueller has said that no mistakes were made in Amerithrax. Yet the leaks continued in 2003 only because no proper leak investigation was done after the August 2002 leaks. US Attorney Roscoe Howard says that the three people in the loop in his office were not asked whether they had been the source of the leak. It turns out that the lead criminal prosecutor –whose sister-in-law and brother were arguing that terrorism should not be attributed to Bin Laden — was the source of the leaks. His sister says to be born in Palestine is necessarily to be political. See Wash Po. He was born in Haifa in 1948. His daughter came to represent the other “anthrax weapons suspect” pro bono. Director Mueller’s response, rather than ensure a proper leak investigation was done, was to compartmentalize the squad over chief investigator’s Lambert’s objection that they would not be able to “connect the dots.” Wasn’t that a big mistake? I’m not a big proponent that polygraphs should have been done given their unreliability. But doesn’t Director Mueller find Roscoe Howard’s claim at deposition that no one in his office was asked whether he was the source of the leak a mistake? (Perhaps Mr. Howard was not being precise and in fact Mr. Seikaly was asked — and his and Howard’s entry into private practice was the result). And so perhaps the issue of the leak and any failure to forthrightly address the issue when it first arose eventually was adequately addressed. But then were there still the consequence of the compartmentalization that led to a failure to connect the dots? Where is the evidence that indicates Ivins is guilty? The false suggestion by the former schoolmate that Ivins followed her to Gaithersburg a quarter-century earlier? The false claim that it was stored in 1425 under Ivins’ exclusive control? The report of the addictions counselor on house arrest for drunk driving? The opinion of the FBI’s forensic psychiatrist? 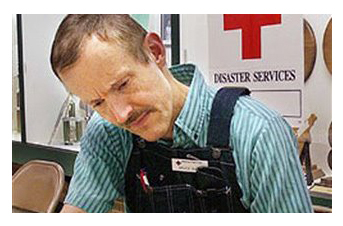 Ivins’ upset that his life and career was in ruins? The fact that he kept letters to the editor he wrote? The fact that the genetics had winnowed the field from 1,000 to up to 300? The fact that Bruce wrote a cute poem? The fact that he followed the major outlet press about a fatwa being issued and the FBI in some affidavits mischaracterized that as coming before the anthrax mailings rather than after the first one? How were the investigators in the Third Squad supposed to be able to connect the dots? How were the investigators in the squad pursuing Ivins supposed to connect the dots? Did the FBI even interview the relevant people? Won’t that, without more, be provably a really big mistake? Were Taylor, Persichini and Montooth up to the challenge of connecting the dots without the help of people spending full-time on the details? Taylor was a political appointee from the Bush Administration. Will Amerithrax have proved a career-ender for anyone who thinks that what was disclosed against Ivins constitutes sufficient evidence on which to close Amerithrax? Isn’t the week that the largest number of CIA personnel have died a good time in which to end bureaucratic practices that make connecting the dots less likely? * what is compelling evidence? 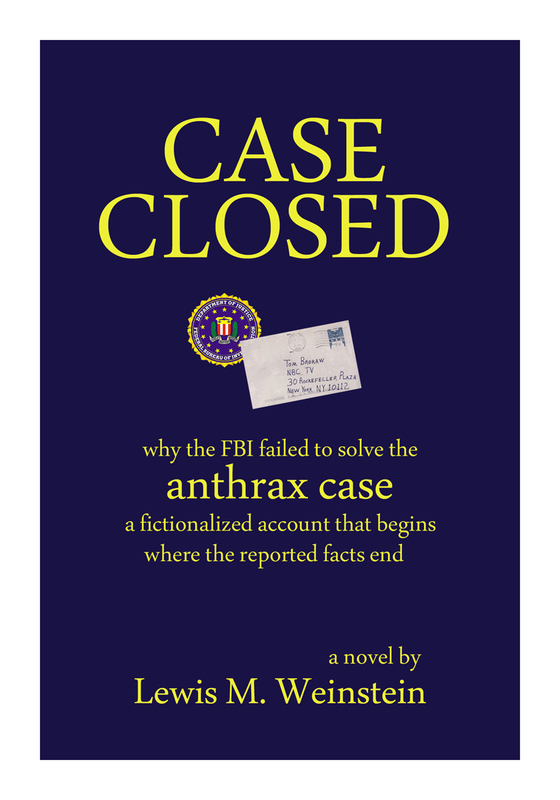 … when will we know if the FBI has produced a compelling case in the 2001 anthrax attacks? Ed asked … And who determines what is “compelling evidence”? plus actual evidence to prove that narrative. Underlying anything that might be called compelling evidence that a particular person was the sole perpetrator of the anthrax attacks must be a plausible narrative, a description of what “could have happened” that accounts for all of the known details. This means that the alleged perpetrator must be shown to have had access to the particular anthrax used in the attacks, and that he (or she) could have delivered it to those mailboxes where it is alleged to have been mailed. The science and the timelines must fit. So far the FBI has not come close to a plausible narrative. it is necessary but not sufficient. There must also be evidence to prove that what “could have happened” in fact did happen. Does the anthrax the alleged perpetrator had match (by means of valid scientific tests properly conducted) the anthrax which killed five people and was disbursed widely in post offices and other places? Is there real physical evidence that the alleged perpetrator actually delivered the attack anthrax as it was believed to have been delivered? If there is no physical evidence to link the alleged perpetrator to the crimes, and it seems there is none, then it must be established that there are no other possible perpetrators who are just as likely as the one charged to have committed the attacks, based on the actual evidence. Did others have access to the attack anthrax? It seems as if at least 100 other scientists, and countless possible accomplices, did have access. Could any of these others (who had access) have delivered the anthrax (by themselves or with accomplices)? So far the FBI has presented no evidence to isolate the one they accuse (Dr. Bruce Ivins) from any of the other possible perpetrators. The FBI has refused to answer many valid questions raised by the media, Congress, and contributors to this blog. The FBI has (seemingly) hamstrung the ongoing NAS review of the science it used. which could never be proven in any court. Which raises the question of why the FBI, which I do not believe is as incompetent as their Amerithrax performance would suggest, has stubbornly focused on Dr. Ivins when they cannot (or at least so far have not) prove their case. To me, that’s the most frightening question of all, the question I raised and answered (fiction!) in my novel CASE CLOSED. “The whole Anthrax episode is unquestionably a dark moment in American history. But what makes it fascinating is how it was handled (or should I say mishandled) by the administration and the various agencies involved. Every once in awhile, it’s good to re-visit just how weak the FBI case against Dr.Bruce Ivins actually is. QUESTION: Jeff, did you find any handwriting samples or hair samples that would have matched Dr. Ivins to the envelopes where the hair samples were found in the mailbox? 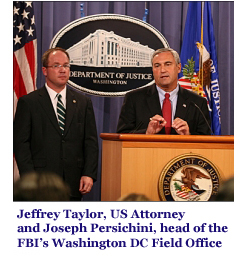 JEFFREY TAYLOR, U.S. ATTORNEY FOR DISTRICT OF COLUMBIA:: Do you want to take that? JOSEPH PERISCHINI JR., ASST. DIR. IN CHARGE, FBI WASHINGTON FIELD OFFICE: We did not find any handwriting analysis or hair samples in the mailbox. So there was no forensics for that part. QUESTION: Did you take handwriting samples from Dr. Ivins? PERISCHINI: We examined handwriting samples, but then there was no comparison made or a specification identification of the handwriting. And it appears that if the analysts would look at it, that there was an attempt to disguise the handwriting. So he was unable to make a comparison. TAYLOR: With respect to handwriting samples, we did have indications from individuals with whom we spoke that there appeared to be some similarities in handwriting that were apparent. That said, we did not have a scientifically valid conclusion that we thought would lead us to be able to admit that in evidence. Were you ever satisfied that you were able to run down that letter and the author of that letter? TAYLOR: Not aware of any connection. To my knowledge, there’s no evidence linking the two. QUESTION: In your affidavits, there’s a footnote that notes — indicates you searched, you had probable cause to search “other individuals,” more than one. Can you talk about the scope of the number of people you searched that you had probable cause on? TAYLOR: I’m not going to get into the details of other investigative techniques that were handled — that were used in this case with the other individuals. We’re here today to say, based on all that investigation, we stand here today firmly convinced that we have the person who committed those attacks, and we are confident that had this gone to trial, we would have proved him guilty beyond a reasonable doubt — Mark. QUESTION: Can you tell us how Dr. Ivins was able to get the anthrax out of the lab and he did not get sick himself? Also, were you able to place him at the mailboxes in Princeton? TAYLOR: With respect to your first question about getting the anthrax out of the site, Dr. Ivins — and correct me if I’m wrong, Ken — had vaccinated himself against anthrax. With respect to the mailbox, as I laid out before, there is ample evidence in this case pointing to Dr. Ivins as the individual who drove to Princeton to mail those letters. He had the hours in the hot suite (ph) during the relevant times. We looked at the records when he was at work and when he would have had time to drive to Princeton, New Jersey, and it’s clear from those records that he had time on the relevant occasions to drive to Princeton, mail the envelopes, and come back. There’s also evidence I’ll refer you to in the affidavits concerning where that mailbox was located in Princeton, New Jersey, in relation to some obsessive conduct on his part with regard to a sorority. Again, it’s a chain of evidentiary items that, assembled together, leads to one reasonable conclusion, and that is Dr. Ivins mailed that anthrax in those envelopes from that mailbox in Princeton. QUESTION: (OFF-MIKE) a gas receipt or that shows he was there? I mean, actually proves that he was in that area? TAYLOR: We don’t have that piece of direct evidence you mentioned. QUESTION: Sir, two questions. Is there any evidence at all that Dr. Ivins, based on his knowledge of his co-worker, somehow framed or set up Dr. Hatfill? TAYLOR: There’s no evidence to indicate anything like that. I have been asking you for the past two months to provide legal authority for the decision to sequester and withhold FBI-submitted documents until the end of the study. You have indicated twice that you had referred the matter to NAS counsel. 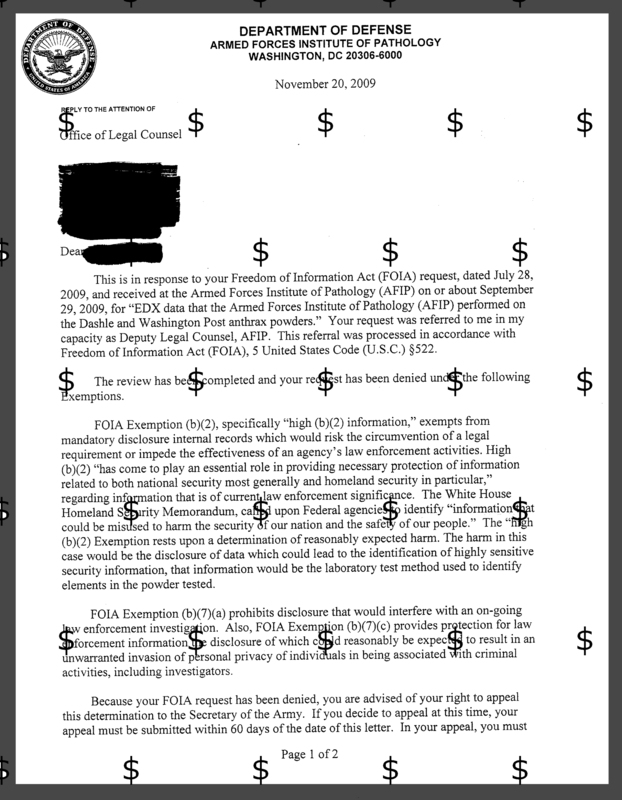 Now we have the NAS/FBI contract document, which provides no legal justification for withholding the FBI-submitted documents until the end of the study or for failing to provide the specific exemptions for any documents NAS is currently withholding. Temporarily withholding FBI-submitted documents until the end of the study. Permanently withholding access to FBI-submitted documents. It is utterly incredible to me, and very disappointing, that you, and thus the NAS, have simply ignored the questions I have asked regarding the FBI-submitted information. If you have reasons for not releasing information, why not state them? Do you have any intention of ever responding, even if only to tell me that in your judgment my questions are inappropriate? per earlier statement, the material is exempt from mandatory public release under the Freedom of Information Act, but we have agreement with FBI to make it public when our report is released: The study committee expects to receive thousands of pages of material from the F.B.I. in the course of its study. Some has already been received; more will be coming as the study progresses. Much of this material is exempt from mandatory release to the public under the Freedom of Information Act. However, we have an agreement with the F.B.I. that all of the material will be made available to the public at the same time that our report is released, so that everyone will be able to review the information that was available to the committee in reaching its conclusions. 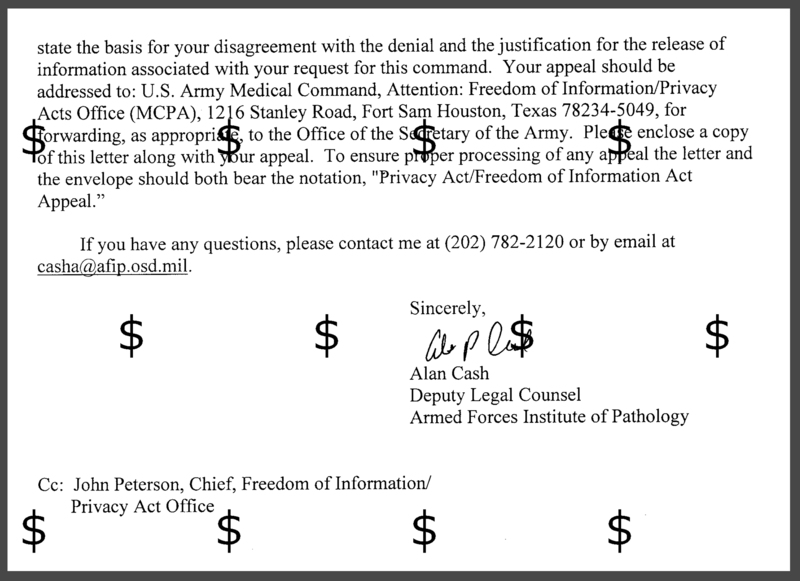 NAS continues to avoid stating the specific FOIA exemption, and does not state any basis for withholding information until the end of the study.